Honey, vegans have noticed, is a food made by bees for bees. When I first became vegan (back when we had to walk ten miles uphill, both ways, to get vegan ice cream only to find it wasn’t invented yet), I heard honey was left to the discretion of the individual vegan. Years later I’d be corrected on that point by a document from the really early days of the vegan movement, unequivocally declaring honey is not ours for the taking. But what about products pollinated by bees? As bees have co-evolved with plants, so have we co-evolved with bees, who pollinate our tomatoes, berries, peppers, squashes and nuts. Can we have these foods without the deliberate exploitation of bees? It seems only vegan-organic growers can claim to produce food for human communities free from the commercial pollinator industry, which takes half its profits from almond production. Store-bought almond milk, almond-based skin-care products, and almonds themselves are vegan; but with such a large human population craving these nutrient-packed nuts, it would be no mean feat to find an almond-based item produced apart from commercial bee pollination. In the United States alone, pollination by honeybees and other insects facilitates $40 billion in commerce annually, according to the North American Pollinator Protection Campaign. But in recent decades, in the shadows of our burgeoning population and the advent of mass-scale agribusiness, flat fields have stretched over habitable landscapes, wiping out hedges and flowering shrubs. Large, social bees such as honey bees and bumble bees have faced “colony collapse disorder”—entire bee colonies dying suddenly. Dairy and other animal farmers are becoming concerned about their stores of feed, including alfalfa. And note that farm animals are being fed seven times the grain that people eat directly, at least in the United States. All told, the overwhelming factor straining bees is animal agribusiness. Varied reports of collapses have appeared out of about half of the United States, from the Mediterranean region, and from Britain, and from China and Australia as well. When we lose what insects do for us, we notice them. Scientists are now urgently recommending conservation efforts for all kinds of insects, given their ecological role as pollinators and evolutionary significance in the web of life. Beekeeping: Part of the Problem? The Public Broadcasting System’s Nature webpage “How can you help the bees?” recommends leaving wild spaces in gardens and avoiding pesticides, and it counsels readers to “put pressure on politicians to reinstate laws that used to prevent importing bees into the country and transporting them across state borders.” Yet PBS displays concern for them only insofar as one species—the species in which we happen to identify ourselves as members—wants to keep taking advantage of bees’ work. In 2007, PBS reported that genetic testing had shown a link between the collapses of bee colonies and a virus. The study was led by the U.S. and Pennsylvania agriculture departments and two universities: Penn State and Columbia. That virus was discovered in 2004, the same year U.S. beekeepers started importing packaged bees from Australia. Thus it’s a bit odd that PBS urges viewers to take up home beekeeping. Beekeeping threatens other animals as well. Gorillas have had to deal with hundreds of bee farmers in Rwanda, Congo and Uganda who use the forestland of the Virunga Mountains to produce beeswax for candles and the cosmetic industry. Meanwhile, a new area of vivisection has arisen, with the aforementioned U.S. government and Penn State researchers setting out to “stress bees in certain ways and evaluate the effect on their health” in order to determine whether the virus itself wipes out colonies or if instead the disorder is triggered by other pathogens and stresses. Israeli researchers have posited that virus-resistant bees can be bred, and initiated yet more experiments, injecting bees with viruses. The earliest pollinators were insects such as beetles, but bees became specialists—more efficient than beetles, butterflies, pollen wasps, or any other pollinating insect. Bees’ ancestors are the wasps—predators of insects. Some wasps, commonly known as beewolves, prey on bees themselves in order to supply food to their carnivorous larvae. Thus, to some beekeepers, predator control means targeting wasps. Unlike bumble bees, who typically form small colonies of 50 to a few hundred members, honey bees might form groups of 30,000 or more, so they’re exploited as high-volume producers. Yet bumble bees can fly in cold temperatures and keep moving after dusk, and they’ve been used for those abilities. Plus, they can pollinate tomatoes by holding a flower while buzzing with their wings to vibrate and loosen the pollen. And as they survive indoors, they’ve been used extensively in greenhouses. Worldwide, humans use bee colonies in the millions to obtain honey, pollen, royal jelly, novelties such as propolis lollipops, mead or honey wine, beeswax candles and cosmetics. To obtain these products, beekeepers regularly disturb the hives, crushing some bees in the process. Beekeepers will replace the bees’ honey with high-fructose corn syrup or cheap, refined sugar. Many beekeepers will clip the queen’s wings or use excluder cages to keep queens from moving hives; many will also kill queens when their egg production wanes. Some keepers smoke bees out of the hive to get to the honey, or torch whole colonies before winter. In a natural environment the queen bee would locate the hive. The bees would gather nectar and pollen to feed their own communities. Do the bees themselves care that they have lost control over their lives? Probably. Bees have brains. And a large body of evidence (often noted as beginning with observations of Austrian zoologist Karl von Frisch) shows that bees exchange information, make group decisions, form abstract concepts and create intricate forms of nest architecture. They have life experiences, steering clear of dangers, and seeking out what appeals to them and sustains them. The usual treatment involved bees applied every other day, thrice weekly, over arthritic areas and the spine. Clients experienced large, hot, itchy swellings, pain and nausea. “During this reactive stage,” recounts Mraz, “the patient often felt worse and would become greatly discouraged about the treatment.” Mraz insists, though, that they would often later become well. An association called the North American Apiotherapy Society began researching and promoting the use of bee venom, which has also been tested on mice as a failed medicine for multiple sclerosis. In the 1990s, Vespa Laboratories and the (U.S.) National Multiple Sclerosis Society gave a research grant to Fred D. Lublin, M.D. and colleagues at Allegheny University of the Health Sciences in Philadelphia to inject mice with doses replicating between four to 160 bee stings, then wait for symptoms such as limb paralysis. They reported no clinical benefit at any dosage level, but said the numbers of mice were too small, and went on to conduct additional studies. There’s a good deal of emerging science on bees these days, but few expressions of how bees matter to themselves. Yet there’s something to be said for stepping outside our own skin some of the time. Our view that everyone else in the bio-community is around at our beck and call is a major underlying factor in Earth’s current biodiversity crisis. Probably the major underlying factor. Are we, at some point in our lives, able to see ourselves as cohabitants with other living communities, rather than the planet’s biggest user? It seems to me this is what vegan striving is about, all the time. Anyone with some garden space can help bees to flourish on their terms. Bumble bees make nests in grass or holes in the ground, such as abandoned mouse nests, so it’s a good idea to leave a spot of unkempt garden space. Early spring flowers are particularly important to new bumble bee colonies, and bees especially appreciate blue, purple, and yellow flowers, planted in clusters. Gooseberry is an early bloomer, and the graceful camas lilies are perfect for bees in the Pacific Northwest and British Columbia. Avoid ornamental types, as they can be short of nectar or pollen; native plants are best adapted to the life cycles of local animals including bees, and also provide key connections to remaining wildlands. Eastern waterleaf, a groundcover, is an example in the central or northeastern United States, where these herbs naturally bloom from May to August. Large, lavender beardtongue blooms over the North American prairie in May and June. Deciduous azaleas are native across North America and so are rhododendrons. Purple prairie clover is indigenous to the North American Great Plains. White clover is native to Europe and Asia, but has become naturalized in much of North America, and if you’ve got it in the summer, it will be a smorgasbord for bees and moreover it’s an edible plant, eaten raw, cooked, baked, or used in teas for its nutritional value. From British Columbia across the prairies and into western Ontario and the adjacent states, the anise hyssop (liquorice mint) blooms all summer, and the flowers also work for teas and traditional tea breads. In the northeastern U.S., late October and early November is the time to collect milkweed seeds for planting in the spring; and native bee balm will attract bees, butterflies and hummingbirds in early summer. The fragrant, dusky-green leaves may also be used in teas. Joe-pye weed, a perennial native from Maine to Michigan, south to central Florida and Texas, is beloved by moths and butterflies and bees. And isn’t it the greatest feeling to walk or jog alongside patches of blooming goldenrod in late summer and see the bees buzzing around them? Asters too, hangouts for bees and butterflies alike, are native to the northern United States as well as Canada from British Columbia to Newfoundland. Aster alpinus is the kind native to North America. In Britain, Aster tripolium, or sea asters, are indigenous. And when autumn arrives in the Northern hemisphere (Europe and North America included), sedum is the bees’ knees, and its leaves are edible too. The growers at the Vegan Organic Network advise us all to do some gardening, even a little, even inside. Like learning to prepare meals, it’s a basic life skill and a way of cultivating vital social networks. What will you grow this year? Would anyone care to add some pictures or pro-bee gardening information? Artist J. Muir paints with vegan, cruelty-free, earth-based watercolors from Colors of Nature. 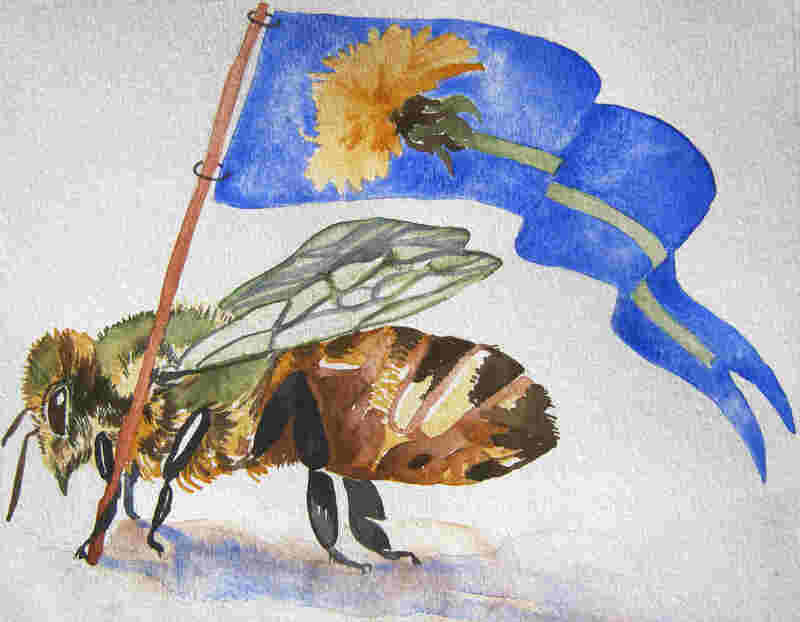 This entry was posted in Liberation Theory, Vegan History and tagged Bees, Colors of Nature, Gardening, Honey, J. Muir, Native gardening, Vegan by Lee Hall. Bookmark the permalink. You’ve given us a wonderful resource that responds to the information gaps so many of us have about honey and the bees who own it. Thank you! I’ll be sharing it. Will, thank you so much for reading this post, for encouraging me, and for sharing the information. I’ll be putting in some kale starts this weekend, and probably a bunch of basil, and a tomato or two as soon as it’s really warm out. I have a very small city row house back yard, but I’ve salvaged some lumber and have been making raised beds. I do let my kale flower, and although it doesn’t attract large numbers of bees, it does keep some food production in my hands, and it offers a food source for lots of insects. This year I plan on maintaining at least two kale plants, and one tomato to transfer “pest” insects onto, so that I can maintain a what I’d call a vegan garden. I have a really hard time removing bugs that are damaging my food plants, and leaving them without food or shelter. Most of them are pretty specific about what they will eat and live on, so it’s like a death sentance to just drop them in the wood chips or grass. I think if I keep one kale plant for “pest” transfers, for every two I grow for food, I will be able to keep a veganic garden up to my personal standards. I’ve encouraged my next door neighbor to keep her (lavender or purple) wild Bergamot (beebalm) and plant more. It’s a wonderful plant, not as showy as some of the bergamot cultivars people are into for their city and suburban gardens, but it blooms for weeks and weeks and has a very lovely, subtle color. The leaves have a pleasant, slightly pungent scent, the flowers are used in tea. The whole plant can be used to make a bright orange > burnt orange fabric dye. It’s also called Oswego tea, and has a ton of medicinal uses. It used to grow in every wild ditch and hillside across Wisconsin and the upper midwest. I haven’t seen much of it in recent years. We need a resurgence of home-grown tea. I know I do. I buy too much packaged stuff. Thank you, Megan; I’ve tweeted a direct link to your comment; it is a bit of inspiration on the vernal equinox. Great entry and advice to help our bee friends. Thanks. And I absolutely love the watercolor — very, very cool. Happy vernal equinox, Lee. Peace and good stuff. Isn’t J. Muir’s art delightful? Glad to know you like the entry. Equinox cheer to your goodself as well. Thank you, Lee, for this presentation. Lots of good information here. I was particulary interested in what you wrote about (1) the extensive use of bees in the industrial production of almonds, (2) veganic farming excluding the need for bee keeping, and (3) the use of bees in animal experimentation. Maryanne, thank you for your note. (1) Yes, bees are exploited in agribusiness in a very high-volume way, though we don’t notice unless something spectacularly disruptive occurs. (2) This is the kind of issue that has prompted me to become a life member of the Vegan Organic Network. They merit all the support we can offer, in my view! (3) Yes, so many grants, careers, legal permanent residency visas etc. ride on the practice of taking animals apart. Bees included. Excellent recommendations. Thanks for sharing! Wow – so much about bees that I didn’t know. Thank you. They are amazing beings, that’s for sure. I love the illustration. I just bought a package of bee-blend wildflowers to add to the garden – will see how they do. To be or not to be ethical? What an informative and well written piece, Lee. Thank you. Vegans really do need this information, as so often we (I) am challenged on not consuming honey and I know I don’t give a satisfactory answer. Having given up honey, I then learnt that I was using bee-wax coated dental floss. So I had “to walk ten miles uphill, both ways” to find vegan dental floss, and I did 😀 It is encouraging to know that people are becoming more aware of the insidious ways manufacturers use non-human animal products. Looking forward to your piece on palm oil – as this indirectly impacts on our fellow inhabitors of this planet. Emy, I’m really glad this information is useful to you. Interesting point about dental floss. Amazon is not the choice for everyone, I know, but the company will ship internationally, so here is a link to some vegan dental floss stockists. Yes, palm oil is a serious issue for vegans and everyone. I’d like to cover that some time this year, at least briefly. Thanks for your kind wishes.